For the Antarctic research station, see Pole of Inaccessibility (Antarctic research station). Map of distance to the nearest coastline (including oceanic islands, but not lakes) with red spots marking the poles of inaccessibility of main landmasses, Great Britain, and the Iberian Peninsula. Thin isolines are 250 km (160 mi) apart; thick lines 1,000 km (620 mi). Mollweide projection. The northern pole of inaccessibility, sometimes known as the Arctic pole of inaccessibility, or just Arctic pole, is located on the Arctic Ocean pack ice at a distance farthest from any land mass. It lies at 85°48′N 176°9′W﻿ / ﻿85.800°N 176.150°W﻿ / 85.800; -176.150﻿ (True Northern Pole of Inaccessibility), 1,008 km (626 mi) from the three closest landmasses: Ellesmere Island, Komsomolets Island, and Henrietta Island. Due to constant motion of the pack ice, no permanent structure can exist at this pole. Until a 2013 review of satellite cartography, the northern pole of inaccessibility was thought to lie at 84°03′N 174°51′W﻿ / ﻿84.050°N 174.850°W﻿ / 84.050; -174.850﻿ (Old Northern Pole of Inaccessibility), which was 1,094 km (680 mi) away from Ellesmere, Franz-Josef Land, and the New Siberian Islands, 1,453 km (903 mi) north of Utqiagvik, Alaska, and 214 km (133 mi) away from the actual northern pole of inaccessibility. The first attempt to reach this false northern pole of inaccessibility was made by Sir Hubert Wilkins, who flew by aircraft in 1927. In 1941, the first Soviet expedition using an airplane landed 350 kilometers north of the false northern pole, thus actually becoming the first expedition to reach the real pole. Ignoring Soviet results, Sir Wally Herbert claimed to be the first to reach what was then considered to be the northern pole of inaccessibility on foot, arriving by dogsled in 1968. Explorer Jim McNeill claimed in 2006 that Herbert did not quite make the pole, and launched his own unsuccessful attempt to reach it. In 1986, an expedition of Soviet polar scientists led by Dmitry Shparo reached the pole of inaccessibility by foot during a polar night. As of 2010, McNeill said that no one had reached the false northern pole of inaccessibility. The southern pole of inaccessibility is the point on the Antarctic continent most distant from the Southern Ocean. A variety of coordinate locations have been given for this pole. The discrepancies are due to the question of whether the "coast" is measured to the grounding line or to the edges of ice shelves, the difficulty of determining the location of the "solid" coastline, the movement of ice sheets and improvements in the accuracy of survey data over the years, as well as possible topographical errors. The pole of inaccessibility commonly refers to the site of the Soviet Union research station mentioned below, which was constructed at 82°06′S 54°58′E﻿ / ﻿82.100°S 54.967°E﻿ / -82.100; 54.967﻿ (Pole of Inaccessibility (WMO)) (though some sources give 83°06′S 54°58′E﻿ / ﻿83.100°S 54.967°E﻿ / -83.100; 54.967﻿ (South Pole of Inaccessibility (IPHC))). This lies 878 km (546 mi) from the South Pole, at an elevation of 3,718 m (12,198 ft). Using different criteria, the Scott Polar Research Institute locates this pole at 85°50′S 65°47′E﻿ / ﻿85.833°S 65.783°E﻿ / -85.833; 65.783﻿ (South Pole of Inaccessibility (SPRI)). According to ThePoles.com, the point farthest from the sea accounting only for the Antarctic land surface proper is at 82°53′14″S 55°4′30″E﻿ / ﻿82.88722°S 55.07500°E﻿ / -82.88722; 55.07500﻿ (point farthest from the sea), and the farthest point when ice sheets are taken into account is 83°50′37″S 65°43′30″E﻿ / ﻿83.84361°S 65.72500°E﻿ / -83.84361; 65.72500﻿ (point farthest from the sea counting ice). These points, calculated by the British Antarctic Survey, are quoted as being "the most accurate measure available" (as of 2005). The southern pole of inaccessibility is far more remote and difficult to reach than the geographic South Pole. On 14 December 1958, the 3rd Soviet Antarctic Expedition for International Geophysical Year research work, led by Yevgeny Tolstikov, established the temporary Pole of Inaccessibility Station (Polyus Nedostupnosti) at 82°06′S 54°58′E﻿ / ﻿82.100°S 54.967°E﻿ / -82.100; 54.967﻿ (Pole of Inaccessibility Station). A second Russian team returned there in 1967. Today, a building still remains at this location, marked by a bust of Vladimir Lenin that faces towards Moscow, and protected as a historical site. Inside the building, there is a golden visitors' book for those who make it to the site to sign. On 4 December 2006, Team N2i, consisting of Henry Cookson, Rupert Longsdon, Rory Sweet and Paul Landry, embarked on an expedition to be the first to reach the historic pole of inaccessibility location without direct mechanical assistance, using a combination of traditional man hauling and kite skiing. The team reached the old abandoned station on 19 January 2007, rediscovering the forgotten statue of Lenin left there by the Soviets some 48 years previously. The explorers were picked up from the spot by a plane from Vostok base, flown to Progress Base and taken back to Cape Town on the Akademik Fyodorov, a Russian polar research vessel. The team found that only the bust on top of the building remained visible; the rest was buried under the snow. On 11 December 2005, at 7:57 UTC, Ramón Hernando de Larramendi, Juan Manuel Viu, and Ignacio Oficialdegui, members of the Spanish Transantarctic Expedition, reached for the first time in history the southern pole of inaccessibility at 82°53′14″S 55°04′30″E﻿ / ﻿82.88722°S 55.07500°E﻿ / -82.88722; 55.07500﻿ (British Antarctic Survey-accredited Pole of Inaccessibility), updated that year by the British Antarctic Survey. The team continued their journey towards the second southern pole of inaccessibility, the one that accounts for the ice shelves as well as the continental land, and they were the first expedition to reach it, on 14 December 2005, at 83°50′37″S 65°43′30″E﻿ / ﻿83.84361°S 65.72500°E﻿ / -83.84361; 65.72500﻿ (British Antarctic Survey-accredited Pole of Inaccessibility). Both achievements took place within an ambitious pioneer crossing of the eastern Antarctic Plateau that started at Novolazerevskaya Base and ended at Progress Base after more than 4,500 km (2,800 mi). This was the fastest polar journey ever achieved without mechanical aid, with an average rate of around 90 km (56 mi) per day and a maximum of 311 km (193 mi) per day, using kites as their power source. On 27 December 2011, Sebastian Copeland and partner Eric McNair-Laundry also reached the 82°06′S 54°58′E﻿ / ﻿82.100°S 54.967°E﻿ / -82.100; 54.967﻿ (Pole of Inaccessibility Station) southern pole of inaccessibility. They were the first to do so without resupply or mechanical support, departing from Novolazerevskaya Base on their way to the South Pole to complete the first East/West crossing of Antarctica through both poles, over 4,000 km. As mentioned above, due to improvements in technology and the position of the continental edge of Antarctica being debated, the exact position of our best estimate of the pole of inaccessibility may vary. However, for the convenience of sport expeditions, a fixed point is preferred, and the Soviet station has been used for this role. This has been recognised by Guinness World Records in regard to Team N2i's expedition in 2006–2007. 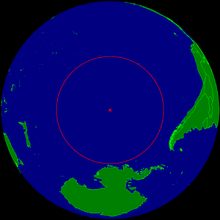 The oceanic pole of inaccessibility (48°52.6′S 123°23.6′W﻿ / ﻿48.8767°S 123.3933°W﻿ / -48.8767; -123.3933﻿ (Oceanic Pole of Inaccessibility)) is the place in the ocean that is farthest from land. It lies in the South Pacific Ocean, 2,688 km (1,670 mi) from the nearest lands: Ducie Island (part of the Pitcairn Islands) in the north, Motu Nui (part of the Easter Islands) in the northeast, and Maher Island (near the larger Siple Island, off the coast of Marie Byrd Land, Antarctica) in the south. Known as "Point Nemo", Nemo being Latin for "no one" and also a reference to Jules Verne's Captain Nemo, it lies more than 1,400 nautical miles from the nearest land. This point was featured in the short story, The Call of Cthulhu, by H. P. Lovecraft as the location of the fictional city of R'lyeh. The area is also known as a "spacecraft cemetery" because hundreds of decommissioned satellites, space stations, and other spacecraft have been deposited there upon re-entering the atmosphere to lessen the risk of hitting inhabited locations or maritime traffic. Point Nemo is relatively lifeless; its location within the South Pacific Gyre blocks nutrients from reaching the area, and being so far from land it gets little nutrient run-off from coastal waters. Distance to the sea in Asia, showing the two candidate locations for Eurasian Pole of Inaccessibility. In Eurasia, the Continental Pole of Inaccessibility is the place on land that is farthest from the ocean, and it lies in northwestern China, near the Kazakhstan border. Earlier calculations suggested that it is 2,645 km (1,644 mi) from the nearest coastline, located at 46°17′N 86°40′E﻿ / ﻿46.283°N 86.667°E﻿ / 46.283; 86.667﻿ (Proposed Continental Pole of Inaccessibility), approximately 320 km (200 mi) north of the city of Ürümqi, in the Xinjiang Autonomous Region of China, in the Dzoosotoyn Elisen Desert. The nearest settlements to this location are Hoxtolgay Town at 46°34′N 85°58′E﻿ / ﻿46.567°N 85.967°E﻿ / 46.567; 85.967﻿ (Hoxtolgay), about 50 km (31 mi) to the northwest, Xazgat Township (Chinese: 夏孜盖乡; pinyin: Xiàzīgài xiāng) at 46°20′N 86°22′E﻿ / ﻿46.333°N 86.367°E﻿ / 46.333; 86.367﻿ (Xazgat), about 20 km (12 mi) to the west, and Suluk at 46°15′N 86°50′E﻿ / ﻿46.250°N 86.833°E﻿ / 46.250; 86.833﻿ (Suluk), about 10 km (6.2 mi) to the east. However, the previous pole location disregards the Gulf of Ob as part of the oceans, and a 2007 study proposes two other locations as the ones farther from any ocean (within the uncertainty of coastline definition): EPIA1 44°17′N 82°11′E﻿ / ﻿44.29°N 82.19°E﻿ / 44.29; 82.19 and EPIA2 45°17′N 88°08′E﻿ / ﻿45.28°N 88.14°E﻿ / 45.28; 88.14, located respectively at 2,510±10 km (1560±6 mi) and 2,514±7 km (1,562±4 mi) from the oceans. These points lie in a close triangle about the Dzungarian Gate, a significant historical gateway to migration between the East and West. EPIA2 is located near a settlement called K̂as K̂îr Su in a region named K̂îzîlk̂um (قىزىلقۇم) in the Karamgay Township [zh], Burultokay County. Elsewhere in Xinjiang, the location 43°40′52″N 87°19′52″E﻿ / ﻿43.68111°N 87.33111°E﻿ / 43.68111; 87.33111 in the southwestern suburbs of Ürümqi (Ürümqi County) was designated by local geography experts as the "center point of Asia" in 1992, and a monument to this effect was erected there in the 1990s. The site is a local tourist attraction. Coincidentally, the continental and oceanic poles of inaccessibility have a similar radius; the Eurasian poles EPIA1 and EPIA2 are about 178 km (111 mi) closer to the ocean than the oceanic pole is to land. In North America, the continental pole of inaccessibility is on the Pine Ridge Reservation in southwest South Dakota about 11 km (7 mi) north of the town of Allen, located 1,650 km (1,030 mi) from the nearest coastline at 43°22′N 101°58′W﻿ / ﻿43.36°N 101.97°W﻿ / 43.36; -101.97﻿ (Pole of Inaccessibility North America). The Canadian pole of inaccessibility is allegedly in Jackfish River, Alberta 59°02′N 112°49′W﻿ / ﻿59.03°N 112.82°W﻿ / 59.03; -112.82﻿ (Pole of Inaccessibility Canada), a few kilometres up the Peace River from where the Jackfish River (one of six Canadian rivers of that name) flows through it. In South America, the continental pole of inaccessibility is in Brazil at 14°03′S 56°51′W﻿ / ﻿14.05°S 56.85°W﻿ / -14.05; -56.85﻿ (Continental Pole of Inaccessibility in South America), near Arenápolis, Mato Grosso. In 2017, the Turner Twins became the first adventurers to trek to the South American Pole of Inaccessibility. In Australia, the continental pole of inaccessibility is located either at 23°10′S 132°16′E﻿ / ﻿23.17°S 132.27°E﻿ / -23.17; 132.27﻿ (Continental Pole of Inaccessibility of Australia) or at 23°2′S 132°10′E﻿ / ﻿23.033°S 132.167°E﻿ / -23.033; 132.167﻿ (Australian Pole of Inaccessibility), 920 km (570 mi) from the nearest coastline, approximately 161 km (100 miles) west-northwest of Alice Springs. The nearest town is Papunya, Northern Territory, about 30 km (19 mi) to the southwest of both locations. In Africa, the pole of inaccessibility is at 5°39′N 26°10′E﻿ / ﻿5.65°N 26.17°E﻿ / 5.65; 26.17, 1,814 km (1,127 mi) from the coast, near the town of Obo in the Central African Republic and close to the country's tripoint with South Sudan, and the Democratic Republic of the Congo. ^ a b c d e f g Garcia-Castellanos, Daniel; Lombardo, Umberto (September 2007). "Poles of Inaccessibility: A Calculation Algorithm for the Remotest Places on Earth" (PDF). Scottish Geographical Journal. 123 (3): 227–233. doi:10.1080/14702540801897809. Archived from the original (PDF) on 29 June 2014. Retrieved 10 November 2016. ^ Duhaime-Ross, Arielle (15 October 2013). "A New Race to Earth's End". Scientific American. 309 (16): 16. doi:10.1038/scientificamerican1113-16a. ^ Jennings, Ken (October 23, 2017). "Forget the North Pole—This Is the Real End of the Earth". Condé Nast Traveler. Archived from the original on January 9, 2018. Retrieved 2018-01-08. ^ "Explorer set for historic Arctic adventure". BBC. 20 February 2006. Archived from the original on 27 May 2006. Retrieved 10 November 2010. ^ Becker, Kraig (10 February 2010). "North Pole 2010: Expedition To The Pole of Inaccessibility is Postponed". theadventureblog.blogspot.com. The Adventure Blog. Archived from the original on 13 October 2016. Retrieved 10 November 2016. ^ Danilov, A.I. "Catalogue of Russian Antarctic Meteorological data 1994". wmo.int. World Meteorological Organization. Archived from the original on 13 May 2016. Retrieved 10 November 2016. ^ "Historic Sites & Monuments in Antarctica". polarheritage.com. International Polar Heritage Committee. 2016. Archived from the original on 29 September 2007. Retrieved 10 November 2016. ^ Headland, R.K. (1996). "Polar Information Sheets". spri.cam.ac.uk. Scott Polar Research Institute, University of Cambridge. Archived from the original on 28 May 2016. Retrieved 10 November 2016. ^ a b "Spaniards reach the 'second' South Pole of Inaccessibility – still no trace of Lenin". explorersweb.com. ThePoles.com. 15 December 2005. Archived from the original on 14 April 2016. Retrieved 10 November 2016. 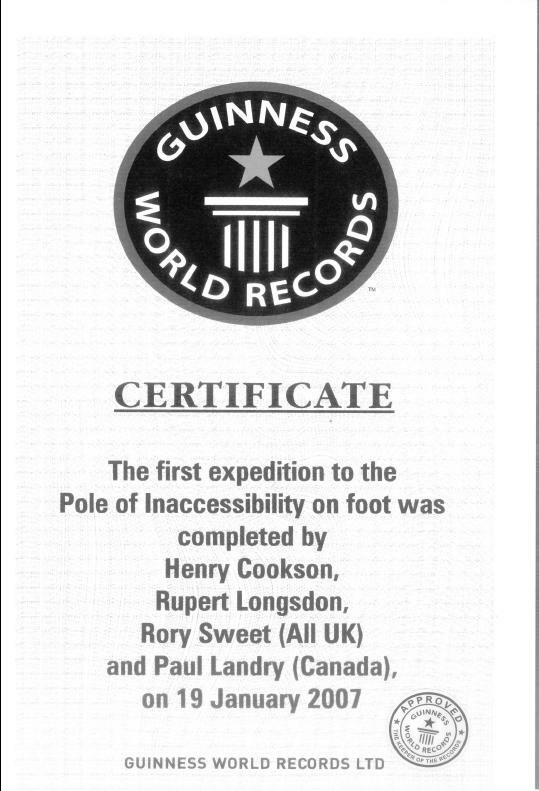 ^ "Team N2i successfully conquer the Pole of Inaccessibility by foot and kite on 19th Jan '07". Retrieved August 16, 2011. ^ a b "UK team makes polar trek history". news.bbc.co.uk. BBC News. 20 January 2007. Archived from the original on 22 November 2016. Retrieved 10 November 2016. ^ "Polar News ExplorersWeb – Spaniards reach South Pole of Inaccessibility – but where is Lenin?". explorersweb.com. ThePoles.com. 12 December 2012. Archived from the original on 21 March 2008. Retrieved 10 November 2016. ^ "Reached the South Pole of Inaccessibility". Barrabes.com. 13 December 2005. Archived from the original on 10 November 2016. Retrieved 10 November 2016. ^ "The South Pole of Inaccessibility". tierraspolares.es. Tierras Polares. Archived from the original on 11 January 2009. Retrieved 10 November 2016. ^ "Polar News ExplorersWeb – ExWeb interview Sebastian Copeland and Eric McNair-Landry (part 1/2): The battle of body and gear across 2 South Poles". Explorersweb.com. ExWeb. 5 March 2012. Archived from the original on 29 May 2016. Retrieved 10 November 2016. ^ "Image: guinness_book_records_team_n2i_antarctic_ec1.jpg, (539 × 791 px)". teamn2i.com. Guinness World Records. 19 January 2007. Archived from the original on 14 May 2016. Retrieved 10 November 2016. ^ a b Davies, Ella (5 October 2016). "The Place Furthest from Land is Known as Point Nemo". bbc.com. BBC. Archived from the original on 4 February 2017. Retrieved 10 November 2016. ^ Lukatela, Hrvoje (26 March 2004). "Point Nemo (or, One Thousand and Four Hundred Miles from Anywhere)". geocuriosa.com. The GlobeCalc Project. Archived from the original on 13 June 2016. Retrieved 10 November 2016. ^ Stirone, Shannon (13 June 2016). "This Is Where the International Space Station Will Go to Die". Popular Science. Archived from the original on 16 June 2016. Retrieved 10 November 2016. ^ "43° 40' 52"N 87° 19' 52" E Geographic Center of Asia – The Heart of Asia (亚洲之心) – Xinjiang (新疆), China". confluence.org. Confluence. 22 June 2006. Archived from the original on 2 June 2016. Retrieved 10 November 2016. ^ "Jackfish River, Alberta". Natural Resources Canada. Atlas of Canada. Archived from the original on 24 September 2014. Retrieved 10 November 2016. ^ "The Turner Twins on trekking to the Green Pole, avoiding disaster and 'fields of plastic stretching for miles' - Country Life". countrylife.co.uk. 30 October 2017. Archived from the original on 10 January 2018. ^ "Centre of Australia, States and Territories". ga.gov.au. Geoscience Australia. Archived from the original on 31 October 2016. Retrieved 10 November 2016. Wikimedia Commons has media related to Pole of inaccessibility.